Rotuma won the Fiji Swim­ming competition in the fi­nal day of Fiji Games at the Damodar City Aquatic Centre yes­terday. The Matelita Buadromo’s Rotuma team collected 20 gold, 11 silver and 10 bronze medals. It was disappointing for Nadi players who left the competition early due to the adverse weather condition. They finished in second place with 14 gold, 18 silver and 17 bronze medals. The capital city side was third with 8 gold, 13 silver and 7 bronze medals. Nevertheless the team from the jet­set town had a clean sweep in the 50m backstroke winning gold, silver and bronze in both the women’s and men’s division. The team consists of Yolani Blake, Cheyenne Rova, Ella Rasau, Hansel McCaig, Netani Ross and Troy Maivusa­roko. Rotuma’s Temafa Yalimaiwai won the men’s 100m butterfly with a new re­cord time of 57.4sec. Rova confirmed they will release the 2019 Pacific Games 16 players follow­ing approval by the Fiji Association of Sports and National Olympic Commit­tee (FASANOIC) selection justification committee. Wellington Phoenix star striker Roy Krishna has hailed the important role his teammates and coach have played in helping him hit top form this season. Krishna scored his first profession­al hat-trick on Sunday, including a 94th minute winner, to help propel the Phoenix to a 3-2 win over Mel­bourne City. The win kept them within touching distance of fourth-placed Adelaide United with one match – against Perth Glory on Sunday – remaining in the season. “It’s always great to win especially when it’s at this stage of the sea­son because we needed that win,” Krishna told SUNsports from New Zealand last night. “The team played very well, work­ing together to create opportunities and it’s a great feeling to be on the score sheet. “It’s my first hat trick as a profes­sional so it means a lot more to me personally. “He puts the fear in anyone,” Rudan told news website Stuff NZ. “We know his skill sets, how im­portant he is. I knew how important he was when I first came to the club. The hat-trick took Krishna’s tally to 18, breaking the record for most goals scored in a single season and making him a frontrunner for the golden boot award. Following the win, interest in the 31-year-old’s signature has report­edly intensified. The striker is out-of-contract at the end of the season and specula­tion that rival A-League clubs have begun circling him continues to gather pace. But the Fijian captain refused to add fuel to the rumours, saying he was focussed on the main goal of going as far as possible with the Nix this season. “I will make a decision when the time is right but for now I want to train hard and do well for the club,” he said. “We would be very happy with a home playoff and will give it our all in the last round because our fans at home have been very supportive throughout the season. Fiji Roads Authority (FRA) chief executive officer, Jona­than Moore has advised members of the public to drive carefully on our roads during this rainy weather. With the heavy rain in the past couple of days, motorists have ex­perienced bad roads with the in­crease and worsening of potholes on roads. 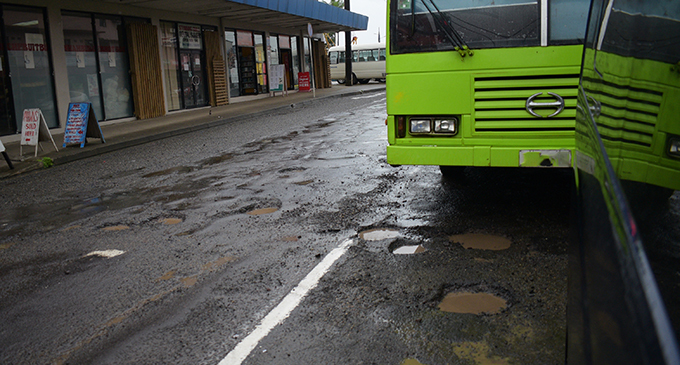 “Potholes are everywhere and we are doing our best to patch it up and minimise this issue,” Mr Moore said. Motorists are advised to be alert while driving so as to avoid road accidents during these periods of heavy rain around the country. The FRA has also closed off a few roads in Rakiraki and the Northern Division and is trying to keep mem­bers of the public safe and out of harm’s way. A man is recovering in Lautoka Hospital after a road accident at the weekend. He was among passengers of a rental car, who were rushed to the Lautoka Hospital on Sunday, after their vehicle collided with an oncoming vehicle and veered off Vuda Bridge, Viseisei in Lautoka. Police spokesperson Ana Naisoro confirmed the incident happened at 4pm on Sunday. She said a vehicle registration JS206 was on its way to Lautoka from Nadi when it allegedly collided with a vehicle registration LR2136. “Due to the impact, vehicle registration LR2136 veered off the bridge and submerged in the river,” she said. Ms Naisoro said a passenger from the private vehicle was recovering in Lautoka Hospital while others were treated and sent home. Police have reminded motorists to take precautions when on the roads. 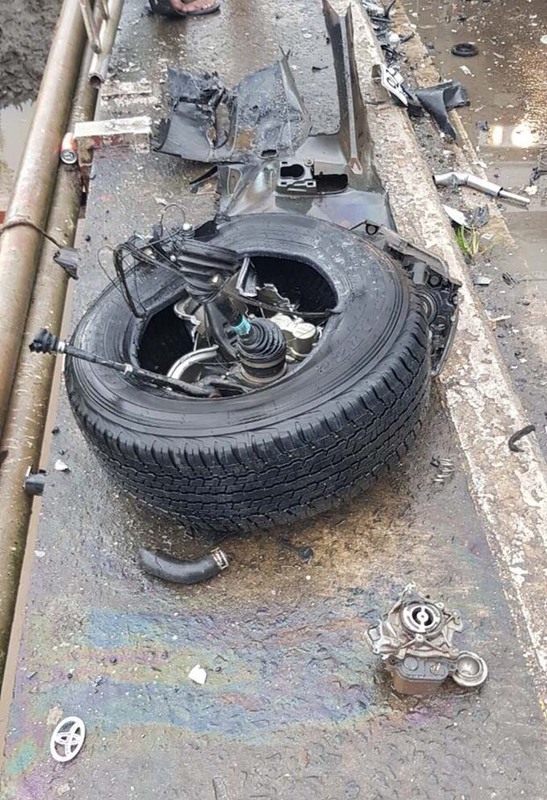 Fiji Roads Authority Communications & Public Relations Officer Zafiya Shamim said, “The vehicle hit the railing and fell into the river. A FRA contractor will temporarily secure the damaged railing area after the Police clear the site”. A top German diplomat has praised Fiji’s presidency of COP23, saying the country set the example for others to follow on an issue of global significance. The outgoing Ambassador of the Federal Republic of Germany, Ger­hard Thiedemann, made this state­ment after his three-year term ended last week. Mr Thiedemann served as the Ger­man Ambassador to seven Pacific Island countries: New Zealand, Fiji, Samoa, Tonga, Tuvalu, Kiribati and the Cook Islands..
Mr Thiedemann said Fiji’s co-oper­ation with Germany through COP23 had been the cornerstone of the re­gion. He added that Fiji made a big im­pact during the COP23 and he was happy to be a part of it. “COP23 was a positive cornerstone for global climate politics and we can really see that as a success story of Fijian-German cooperation. Fiji presided over the COP23 in Bonn, Germany, from November 6 to 17, 2017. COP 23 formally known as the 23rd Conference of the Parties to the United Nations Framework Conven­tion on Climate Change (UNFCCC). The UNFCCC was adopted in 1992 at the Rio Earth Summit, which marked the beginning of the inter­national community’s first concert­ed effort to confront climate change. In an earlier statement, Prime Min­ister Voreqe Bainimarama high­lighted the high ambition for climate action that Fiji has promoted as COP23 President to continue under the COP24 Presidency of Poland. Mr Thiedemann added Fiji has con­tinued to show its support by voting Germany as a non-permanent mem­ber of the United Nations Security Council for the 2019-20 terms. This is the sixth time that the coun­try has assumed major responsibil­ity for peace and security in this function. “We are happy that the Fijian gov­ernment voted for us, because it is not always about assistance, but we also enjoy collaboration on a high-level approach,” he said. “It was an effort that will dominate the 21st Century and the upcoming generation. Mr Thiedemann said he was leav­ing with a heavy heart, knowing that Fijian-German relations had further strengthened through his three-year term. “This is my first time in the South Pacific and I have learned a lot along the way,” he said. “I have had the advantage to travel to Kadavu, where the German aid provided the solar power to commu­nity halls. An organised family picnic at Nasilai Beach, Kiuva, Tailevu, turned tragic when Vunimono High School Year 10 student Rayshal Roy, 15, drowned. His father, Atish Chand, said they had been planning for this picnic for quite some time and agreed to have their picnic at Nasilai Beach on Sunday. Mr Chand said the family arrived at the beach around midday and the incident happened around 2.15pm when Rayshal was swept away by big waves. He said he had been taking pictures of fam­ily members swimming when the incident hap­pened. Mr Chand said he tried to save his son, but it was too late because he was carried away by the waves. “I only saw him twice and that was the last time I saw him,” he said. He said Roy knew how to swim and they used to go for family picnics at Colo-i-Suva. Rayshal was found dead yesterday by 18-year-old Tomasi Naborisi from Vadrai Village in Na­kelo, Tailevu. He said they searched Nasilai Beach on Sun­day when the Police alerted them of the miss­ing boy believed to have drowned. Tomasi said they did not see anyone because it was getting dark so they returned to their vil­lage. Yesterday, he said, as soon as he woke up he went again to search for the missing boy. “I went down the beach from my village and as I neared the place where they were swimming, I found a body washed ashore,” he said. 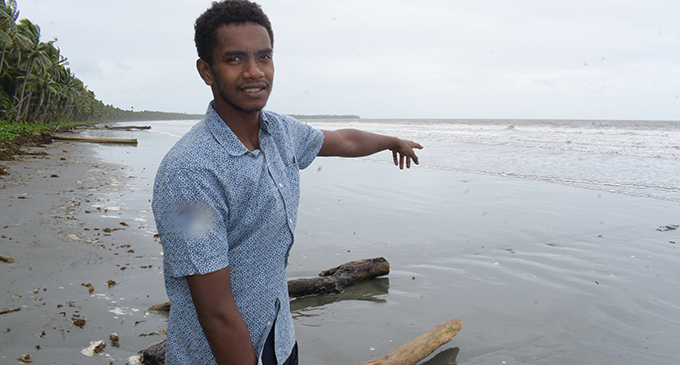 Tomasi Naborisi 18 shows where he found the body of 15 year-old Rayshal Roy at Naselai Beach in Tailevu on April 22, 2019. Photo: Ronald Kumar. Tomasi said they were at the roadside with the body when the Police arrived and took Rayshal to Wainibokasi Hospital. Rayshal’s elder brother is in Year 13 at Vuni­mono High School and younger brother in Year 3 at Vunimono Primary School. Police spokesperson Ana Naisoro confirmed the discovery and renewed a warning for mem­bers of the public to adhere to safety advisories in light of heavy rain and flooding experienced in parts of the country. Parents and guardians have also been urged to ensure that children do not play near or in flooded drains, creeks and rivers. Former Member of Parliament Mere Samisoni has accused the SODELPA leadership of “dirty politics”. This is the first time she is speaking out publicly after declaring her position in a confidential email exchange with other party members leaked to the Fiji Sun. The Hot Bread Kitchen owner, a founder of the party and an unsuccessful 2018 election candidate, also called the party “a dictatorship dressed up like democracy”. The Hot Bread Kitchen owner said that the party conspired to kick her out of the 2018 General Election by telling the voters that if they did not like the local candidate, they could vote for the party. The voters were confused, she added. Ms Samisoni said the communication between the party and the voters must have clarity. It was part of good governance, accountability and transparency. She said that the same pattern was evident statistically in the Central – Naitasiri, Tailevu South, Rewa, Lami, Nasinu, Suva; the West, the South and minimally in the North. “I was informed by one of the successful candidates, from the North, that he chased away the HQ team when he identified their motives in time,” she said. Ms Samisoni said the whole idea of the constituency was to identify candidates, who members could access help from before and after the election. It required candidates who were active and well-grounded in serving their local communities, she said. She said the party violated its own policy objective to win more seats. Opposition leader and former party leader, Sitiveni Rabuka, said her comments were unfair. He said the strategy used was in the best interests of the party. Respect for women and their abilities – Ms Samisoni said these were often not welcomed by men used to positions and relationships of power. The Sri Lankan community in Fiji is still trying to come to terms with the bombings back home, which has left near 300 people dead and hundreds more in hospitals. Eight co-ordinated blasts shook the island nation, three in churches where worshippers had gone for Resurrection Sunday prayers and three hotels targeting tourists with two other areas where alleged suicide bombers struck. Sri Lanka’s Honorary Consul to Fiji Ajith Kodagoda confirmed that there were no reports of any Fijians injured in the bombings, adding that they were all shocked at what had happened. “Well we are very, very surprised and saddened. Our community in Fiji consists of all faiths and we are altogether without any differences on this matter. We have never had this amount of casualties in one incident even during the civil war. It’s now close to 300 deaths,” he said. Fijian Holdings Limited chief executive officer Nouzab Fareed lost a close friend who had gone to one of the churches attacked in the blasts. He recalled visiting those areas in Sri Lanka and shared his disbelief that something of this nature happened there. Speaking about the church in Colombo which was torn apart in the bombing, Mr Fareed said people from all faiths frequented that church. “The belief is that the church has healing powers. I have been there with my wife and people from different religious backgrounds go there often. That is a place of miracles and that is a symbol of Sri Lanka’s multiculturalism,” he said. Of the four hotels that were bombed, the Shangri-La was Sri Lanka’s newest five-star hotel while also targeted was the island nation’s first five-star hotel – the Cinnamon. Mr Fareed said no one expected such an incident to take place back home. “We have hardly had any issues at international level and I don’t think this is linked to international terrorists,” he said. Mr Fareed confirmed that there were no reports of any Fijians losing their lives or sustaining injuries in the blasts. As questions continue to be asked, the Sri Lankan community here continue to frantically reach out to friends and families back home to get details of their welfare. A man facing damaging prop­erty charges has been re­manded in custody by the Suva Magistrates Court. Druavalu Yalimaiqamea appeared before Magistrate Jioji Boseiwaqa during a special court sitting yes­terday. It is alleged that Yalimaiqamea, on April 17, 2019, at Suva, wilfully and unlawfully damaged the showroom glass of Bobs Hook Line and Sinker on Thomson Street valued at $700. Police prosecutor Corporal Sanil Kumar served the accused with full phase disclosures. He objected to bail on the ground that the accused was a habitual of­fender. Magistrate Boseiwaqa re­manded the accused in custody and adjourned the matter to May 6 for mention. Yalimaiqamea was also told to file a formal bail application. A man, who allegedly burned his neighbour’s house at Batinikama in Labasa last Thursday, is still admitted at the Labasa Hospital. This was confirmed by the Divi­sional Police Commander (DPC) Northern Senior Superintendent of Police (SSP) Eparama Waqa yesterday. “He tried to commit suicide after the alleged fire incident and Police had to take him to Labasa Hospi­tal. We are waiting for the doctor to provide us with the clearance so that we can take him to the station for questioning,” he said. Esala Delana Kama is charged with one count of assault causing actual bodily harm. He appeared before Magistrate Jioji Boseiwaqa during the special court sitting yesterday. Police prosecutor Corporal Sanil Kumar served the accused with full phase disclosures. He objected to bail being granted on the grounds that the accused and the complainant lived on the same property. He told the court that there was a high chance of interference with the prosecution witness by the accused if he was released on bail. The matter was adjourned to May 6 for mention. A 27-year-old unemployed man of Nasinu has been remanded in custody after appearing during a special court sitting at the Nasinu Magistrates Court yesterday. Manueli Nakurekure appeared before Magistrate Charles Ratakele charged with one count each of un­lawful possession of illicit drugs and of resisting arrest. It is alleged that on April 19, 2019, at Nasinu, Nakurekure had in his possession 1.7 grams of cannabis sativa, an illicit drug. On the same day, Nakurekure al­legedly resisted arrest by Police constables in execution of their duty. Police prosecutor Constable Satereki Mocevakaca served the full phase disclosures to the ac­cused. He objected to bail and sought the court’s assistance for the accused to make a formal bail application. Magistrate Ratakele ordered the accused to make a formal bail ap­plication. The matter was adjourned to April 29 for mention to check on the bail application and the prosecution’s response. The Fiji Rugby Union has joined renowned corporate organisations and sporting bodies by teaming up with The Coaching Room. And Fiji Airways Fijian 7s head coach Gareth Baber is among the many clients who are trying to unlock their full potential by joining the or­ganisation which was incepted in February 2006 by Australians Joseph Scott and Jay Hedley with the concept Together Everyone Achieves More (TEAM). Other sports organisations teaming up with Coaching Room are Rugby Australia, New South Wales Rugby, Wallabies and Waratahs while cor­porates include our own international airline Fiji Airways, Optus, KPMG and many more. Baber said: “As a sports coach and leader I am exposed to the numerous differing and diverse is­sues which can affect performance. “Through the work I have accomplished with Jay I feel that I am beginning to have a greater understanding of these issues as well as those strategies which are required to enable an in­dividual and team to rationalise and overcome such problems. “The focus of this work has very much sur­rounded my own coaching process and specifi­cally my own in built belief system. “Through challenging this process and mind­set, I’m recognising how my own personality and characteristics play such a pivotal role in my coaching and particularly my relationships with my players. A 20-year-old unemployed man of Nasinu appeared at the Magistrates Court in Nasinu yesterday during a spe­cial court sitting charged with one count of assault. Lepani Liunaba appeared before Magistrate Charles Ratakele at the special court sitting yesterday. Police prosecutor Constable Satereki Mocevakaca did not object to the bail, however he requested the court to grant bail on two suit­able sureties and strict bail condi­tions. Liunaba had two sureties present in court. However, Magistrate Ra­takele declined to accept the sure­ties because they were his niece and nephew and said the proposed sureties did not have any authority over the accused. The accused was remanded in cus­tody and the matter was adjourned to April 23 to check for suitable sureties. A woman was transferred to CWM Hospital from Savusavu District hospital after she was beaten with a knife blade sustaining injuries from her ex de facto partner Oliver Whippy. Whippy attacked the woman at the Koro Sun Resort, where she works, brandishing a cane knife on the morning of August 25, 2018, after days of phone threats and harassment. Whippy was found guilty after trial on the charge of one count of causing grievous harm and pleaded guilty on his own plea of two counts of criminal intimidation. Telling her he was going to kill her, Whippy wielded a blow with the knife towards her neck, a blow that she fended off with her hand resulting in the grievous harm to her hand, that needed subsequent surgery at CWM Hospital. Whippy dragged the woman from her office through the grounds of the resort beating her with the blade of the knife and uttering threats of murder. Her colleagues filmed the ongoing attack. Police arrived at the scene, however Whippy threatened to kill the woman if they came anywhere near him. The Police were able to defuse the situation and Whippy surrendered himself and the knife. Whippy was sentenced to five years imprisonment at the High Court in Labasa on April 17 by Justice Paul Madigan. Whippy is to serve a minimum of four years imprisonment before being eligible for parole. He is 37 years old and until his arrest was a farmer at Wainunu in Bua. He has two daughters, including an 18-month-old, from his relationship with the woman. “There is serious aggravation to this offence in that the continuous assault took part in a well-known Vanua Levu tourist resort, where tourists could well have been alarmed by witnessing mayhem in what they would have expected to be a peaceful welcoming Fijian resort,” Justice Madigan said. He added that any crime that would impact on tourist perception of the hidden paradise must be regarded with great severity. The national team aim to do Fiji proud at the 2019 Touch World Cup in Malaysia on April 29 – May 4. Fiji Touch Federation vice-president Trevor Cleary said the teams, which departed yesterday, are made up of senior and young players. “We expect a good outing and the onus is on the players to do well and deliver,” he said. “Our men are in the pool of death with champions Australia and fourth ranked Japan. The men’s team was fifth in the last World Cup in Australia. “We need to go up a notch,”he said. The women Open team is captained by Daniella Kolikoli. Missing from the mixed team is Jasper William High School student Ateca Leiamo who has been selected to be part of the Fiji Women’s 9s Rugby League team to the Pacific Games. Cleary thanked their major sponsor Hooka Rugby and other co-sponsors Greenline, TFL, Kokomo Private, and BSP Life. Pool A: Scotland, South Africa, Singa­pore, Australia, England, Samoa, Fiji. Mixed Open: Fiji, Papua New Guinea, Chinese Taipei, Ireland, Malaysia, Sin­gapore, China, NZ, Japan.